Lack S, Barton C, Sohan O, Crossley K, Morrissey D. Proximal muscle rehabilitation is effective for patellofemoral pain: a systematic review with meta-analysis. Br J Sports Med. 2015;49:1365–1376. Clinical Question: Is proximal musculature rehabilitation efficient in improving outcomes for patients with patellofemoral pain? 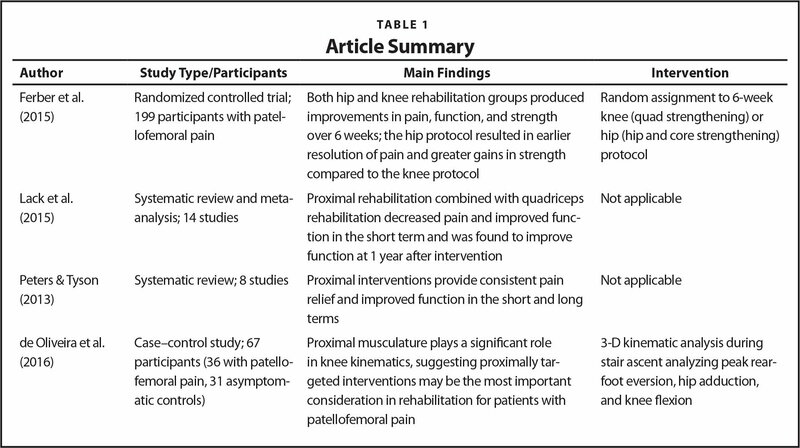 Data Sources: Randomized controlled trials and cohort studies including information on proximal rehabilitation for patellofemoral pain were identified using Web of Knowledge, CINAHL, EMBASE, and Medline databases. Search terms included patellofemoral OR anterior knee pain, AND proximal OR gluteal, AND strength, AND training OR program OR exercise OR rehab. Participants who described having patellofemoral pain, anterior knee pain, or chondromalacia patella without the presence of another knee injury were included. Additionally, participants had to complete a rehabilitation protocol that included exercises directed at the hip or lumbopelvic musculature or both muscle groups. Study Selection: Fourteen studies were included in the review and seven were considered high quality. Data Extraction: Two reviewers assessed each article, and a third reviewer was available for inclusion and quality consensus through the PEDro scale and the PFP inclusion/ exclusion criteria checklist. Means and standard deviations for all data were extracted and entered into the Cochrane Review Manager. Main Results: There is strong evidence to support the use of proximal muscle rehabilitation combined with quadriceps rehabilitation to decrease pain and improve function in the short term (< 3 months) and medium term (3 to 12 months). Compared to quadriceps rehabilitation, there was moderate evidence that indicated proximal rehabilitation decreased pain in the short and medium terms and also improved function in the medium term. Limited evidence was found to support proximal rehabilitation's ability to improve function, increase isometric hip strength, decrease knee valgus while running, or decrease pain in the long term (> 12 months). Conclusions: Based on the evidence found in the review, proximal rehabilitation should be included in a conservative treatment of patellofemoral pain. Combining proximal with traditional quadriceps rehabilitation reduces more pain and improves function in 1 year, which suggests there is a short-, medium-, and possibly long-term value for this rehabilitation protocol. The benefits of using multi-muscle group rehabilitation protocols are faster reductions in pain and earlier improved function. Several randomized controlled trials and cohort studies were performed to compare outcomes of traditional knee-focused rehabilitation protocols with hip and core rehabilitation protocols. Ferber et al.1 found that using knee, hip, and core protocols together produced noticeable improvements in patellofemoral pain and strength. All rehabilitation protocols produce improvements, but hip and core protocols result in an earlier reduction in pain and more strength gains overall than knee-only rehabilitation protocols, which occur over a 6-week period.1 Similar conclusions were made by Peters and Tyson,3 who found that proximal exercise protocols reduced pain and improved function in every study analyzed for their systematic review, as opposed to 80% reduced pain and 75% improved function in knee-only protocols. De Oliveira Silva et al.4 found that proximal muscles are important for stair climbing mechanics because the stronger hip musculature assists knee flexion by decreasing the load through the knee. This evidence indicates that proximal interventions targeting hip and pelvic musculature in addition to the knee provide more consistent outcomes than knee-only interventions. Consistencies in rehabilitation protocols give clinicians more certainty in patient outcomes and improvements, which creates efficiency in their care. Conservative treatment interventions for patellofemoral pain should include strength, strength-endurance, and neuromuscular activity exercises of the proximal musculature.2 Although traditional protocols for patellofemoral rehabilitation are effective, combining hip and core exercises with quadriceps rehabilitation has improved pain and function in the long term.2,5 These exercises should be included in clinical practice for the best possible patient outcomes during rehabilitation, especially because the primary goals for many patellofemoral pain rehabilitation plans are pain reduction and functional improvements. Table 1 provides a comprehensive list of the articles, participants, and main outcomes of the studies used in this article. Further research is needed to determine the most appropriate and effective protocol design that includes proximal exercises, because the current literature does not detail specific exercises or timelines in their protocols. Identifying specific exercise type, load, and dose will help to improve patient outcomes and specify clinician care to preserve time. Peters JS, Tyson NL. Proximal exercises are effective in treating patellofemoral pain syndrome: a systematic review. Int J Sports Phys Ther. 2013;8:689–700. From the Neuromechanics, Interventions, and Continuing Education Research Laboratory, Department of Applied Medicine and Rehabilitation, Indiana State University, Terre Haute, Indiana.